No one wants to play a show for a listless, ungrateful crowd. A room full of fans is a much more gratifying and lucrative experience. But it usually takes a bit of trial and error – like selling out a show in the Pacific Northwest and failing to fill 12-seat bar in Oklahoma, to know where your fans are and where you should book your shows. When fans listen online, it’s a whole different story. With music players like Myspace and Bandcamp, you can tell how many people listened by the number of people who streamed a track, but you can’t tell where they are when they listen. 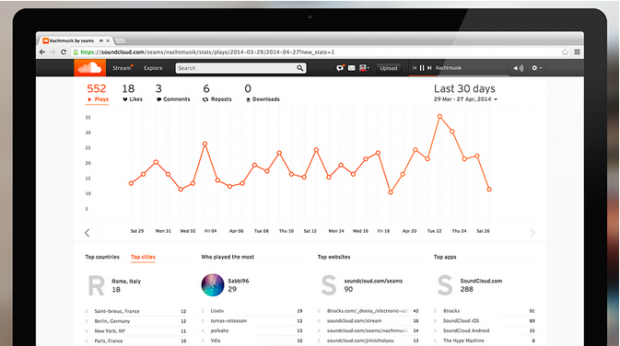 Soundcloud, the current front-runner in cloud-based music streaming just solved that problem. Under the benefits of Soundcloud’s new “Pro” option, you can not only count plays, likes, comments, and downloads like its basic packages, but also get details on who’s playing your tracks and where they are in the world. For anyone looking to market to a specific region or plan a tour, this is an extremely useful tool. In Soundcloud’s newest “Unlimited” option, customers also gain access to information regarding which pages, apps, and social networks tracks are driving views and listens.